Coming from academia myself, I know all too well that many educators are experts in a particular subject (Math, Marketing, Finance, etc.) but not necessarily in areas of learning. Very little time of my PhD was dedicated to developing skills in pedagogy, andragogy, learning and the related fields…and, after over 25 years as a professor, I feel this is true for many faculty members. What many have learned, we have learned on the job, through sharing of practices, trial and error, and of course out of curiosity (all of which are great ways to learn by the way). In France, to my knowledge, we don’t have anything akin to the Professional Standards Framework found in the UK (a nationally-recognised framework for benchmarking success within higher education teaching and learning support). (learn more here). Nonetheless, programmes that are recognized by the State need to show in what ways faculty skills are developed and maintained. The UKPSF offers a great starting point to do a deep dive if you’re interested. The desire I had to start to build a list comes from numerous exchanges with faculty that want to learn more about learning. As educators, we want to better understand our responsibilities and what methods,tools and techniques exist. I don’t claim to be an education « guru », but once again, after 25 years on the job, and a passion for learning, I thought I could bang out a nice list. Turns out the list is a bit long, so I’m breaking into multiple parts. So without further explanation, here are the first five elements of the list – in no particular order. If you have a favorite you’d like to add, please leave a comment. According to David Kolb, « Learning is the process whereby knowledge is created through the transformation of experience ». 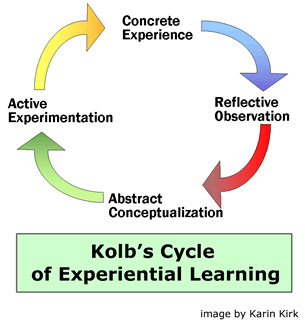 The Cycle of Experiential Learning is a useful model that defines a 4-stage process of experiential learning. The University of Leicester offers a nice table of learning activities course designers can consider for each of the stages that I replicate here. « The objective of the course is to understand the key elements of a business plan ». Unfortunately, this objective, as written, is not very useful as it doesn’t make clear how « understanding » is measured or shown. Let »s face it, learning objectives are tough for everyone. Benjamn Bloom helped make our job easier as educators by creating a taxonomy of verbs by level of learning. 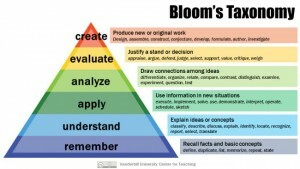 The Taxonomy propoed by Bloom breaks down objectives into cognitive and knowledge dimensions. The cognitive dimension is most often used to define learning objectives. Once the objective is well defined, assessment methods are actually quite obvious. I always have the list of verbs handy when creating a course syllabus. Here is a nice verb list from Azusa Pacific. 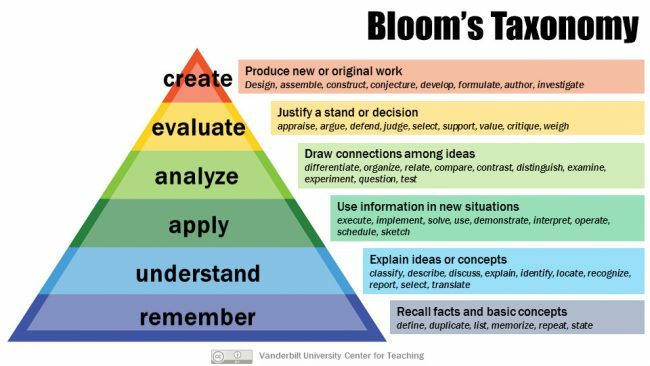 The CC graphic is from Vanderbilt University Center for Teaching. Remember : Exhibit memory of previously learned material by recalling facts, terms, basic concepts, and answers. Apply : Solve problems to new situations by applying acquired knowledge, facts, techniques and rules in a different way. Analyze : Examine and break information into parts by identifying motives or causes.Make inferences and find evidence to support generalizations. Evaluate : Present and defend opinions by making judgments about information, validity of ideas, or quality of work based on a set of criteria. The 9 events defined by Robert Gagné provide an interesting instructional design model (like ADDIE). Gagnés model is often used to develop e-learning as well. The 9 events can be applied in a supplantive (teacher directed) or generative (learner generated) approach. Stimulate recall of prior learning – Connect with past learning. Reassure learner. pre-requisites are in place. Build self efficacy. Present resources/content – Chunked to avoid cognitive overload. Learning Activities. Elicit performance – Learner does something with new knowledge. Self test. Creation. Lab. Provide feedback – Assessment. What went well. Areas to improve. Assess performance – Summative assessment possible. Enhance retention & transfer – Apply in a personal context or in the field. Typically, a scaffold is a temporary structure used to support workers in the construction of an edifice. But scaffolding also exists in education…and it is quite similar. Scaffolding comes into play primarily in the zone of proximal development where guidance is required (between what the learner can do without support and what the leaner can’t do). Scaffolding is changing the level of support or guidance (peer or instructor) to suit the cognitive potential of the learner. Scaffolding is gradually removed over time as the learner develops. As course design moves from « I do it », « We do it together » to « You do it together » and « you do it », the level of the support structure (scaffold) decreases and responsibility moves from the instructor to the learner. This is a constructivist approach to learning. Different types of scaffolds (support structures) exist. The article provide by Northern Illinois University is nice pace to start. 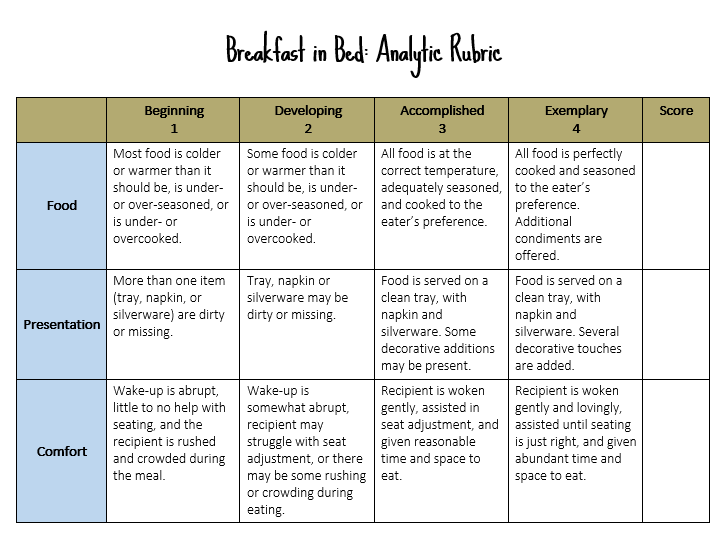 Rubrics are often referred to as grading « grids ». They help the assessor provide a « mark » on an assessed piece of work or activity. Rubrics are required by accreditation bodies.There are 2 types of rubrics : Holistic and Analytic. A holistic rubric is defined by a single scale (A,B,C,D,F for example) and the criteria required to achieve the grade. All criteria are listed next to each potential sore. The holistic rubric requires few decisions by the assessor BUT creates issues when a piece of work does not fit nicely into one category. In these cases, some people recommend using an « all or nothing » rule (if all criteria are not met at one level, the lower level must be applied). 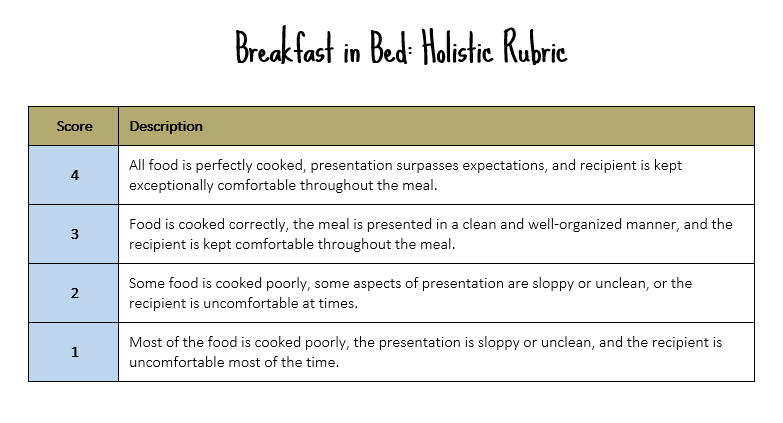 Here’s a simple example from the Cult of Pedagogy, showing us how to offer breakfast in bed to someone. The Analytic Rubric offers multiple criteria across a fixed scale (under expectation, meets expectations, exceeds expectations, etc.) Analytic rubrics can be associated with a weight and numerical value for each grid item. Some LMS systems offer integrated analytic rubric grading. They are great for feedback BUT there is the initial upfront cost (time to build) Needless to say, those that create them find that the old saying « pay me now, or pay me later » holds true, and in fact, total grading time is reduced if you’re ready to build the rubric.